Almost one year ago to the day, the Los Angeles Lakers went to Dallas for a matinee game and suffered a 49-point defeat in what was the worst loss in franchise history. On Saturday, two of the only players who were around for that game made sure to exact some revenge. 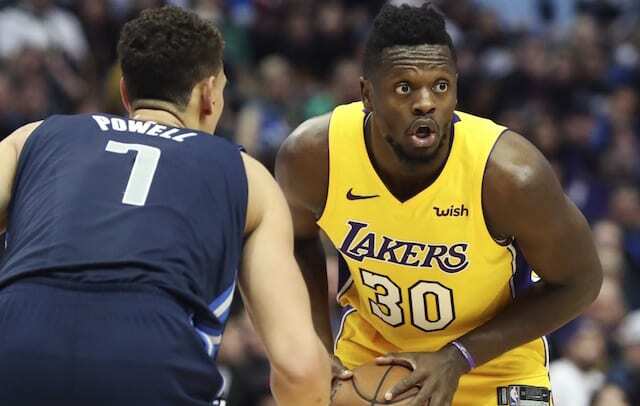 Julius Randle had another big performance and Jordan Clarkson seemed to find his mojo again as the Lakers survived a Brandon Ingram injury, and a late collapse in the fourth quarter, to beat the Mavericks 107-101 in overtime. This was the Lakers’ first victory over Dallas since 2013. Once again, Randle showed off his best and worst as his 23 points and 15 rebounds overshadowed a team-high seven turnovers. 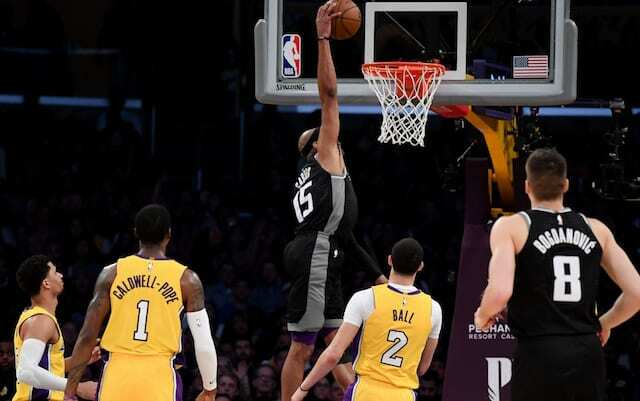 His basket on a Lonzo Ball miss essentially iced the game in overtime, making up for the final possession in regulation where Randal was stripped on a potential game-winner. Clarkson has been in a bit of a slump recently, but added 19 points and four assists including a number of big baskets in overtime. Kyle Kuzma scored 18 points and grabbed 10 rebounds off the bench, as the Lakers needed a team effort to offset the loss of Ingram. Ingram suffered a mild ankle sprain in the first quarter. He returned to the game in the second, after re-taping his ankle, but would eventually leave for good before halftime. Kentavious Caldwell-Pope continued his strong play with 17 points, but his best work was on the defensive end. After Mavericks rookie Dennis Smith Jr. dominated with 17 first-half points, Caldwell-Pope took on the challenge, holding Smith to just six points the rest of the way. Ball had another solid all-around performance with nine points, seven rebounds and seven assists in a roller-coaster of a game. The Lakers got off to a great start but again struggled to maintain their early lead. With their fourth-straight win the Lakers have seemingly gotten back to their form from early in the season. Next up is another early game, on Martin Luther King Jr. day in Memphis against the Grizzlies.